Starting at the center with barely green, the color intensifies toward the edge shifting through to a cool blue-green. 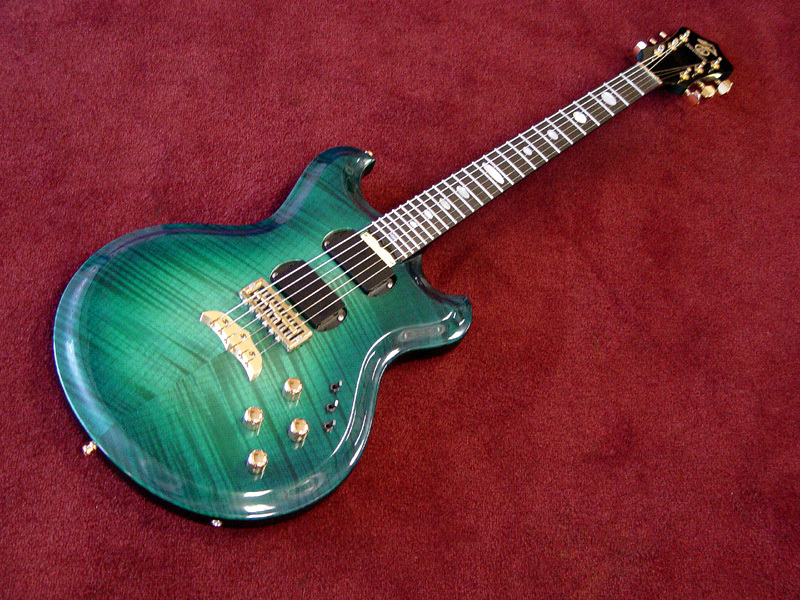 Awesome chevron angled Flame Maple top awash in greens and blues is almost complelling enough to dive in. That's why we call this finish the Oceanburst. We've added amber side LEDs to this guitar that coordinate nicely with the brass hardware and gold knobs. As is typical with the Skylark, the front veneer of the peghead is Ebony with a clear finish. Maple top gives a great bright tone. With electronics that support the natural sound of the guitar, you'll find your effects units have even more range when you start with a definitive clear signal.